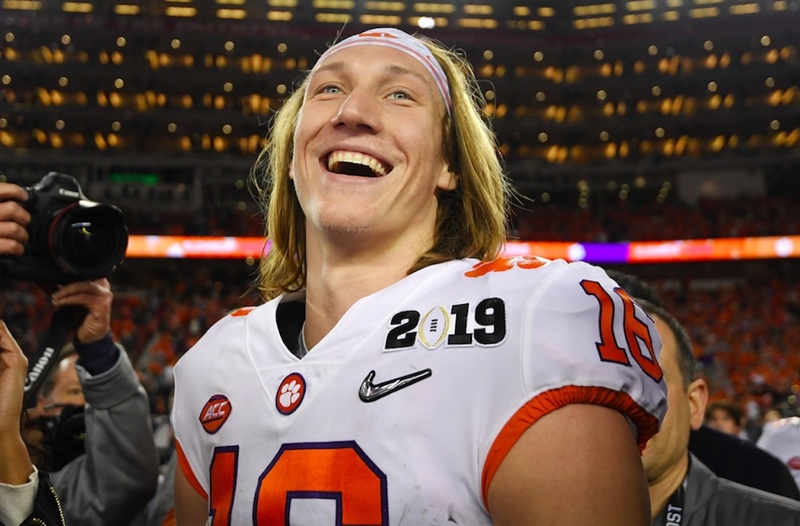 Millions of eyes are now squarely on Trevor Lawrence — the long-haired freshman quarterback who just led Clemson to a lopsided 44-16 national championship win over powerhouse Alabama. That's when Lawrence planted his back foot at the Alabama 15-yard line, eased into a standing-in-the-saddle stance that looked more than a little like Peyton Manning, the man Lawrence pays tribute to by wearing No. 16, and cocked his right arm. With Crimson Tide linebacker Anfernee Jennings bearing down to knock him down, the 19-year-old true freshman fired off a throw that had a hook-shot motion but was delivered with so much velocity that the ball rose along a frozen rope, skimming the tops of the helmets of the linemen scrumming in front of him, sailed over the goal line and through two sets of defenders' raised gloves, and snapped its way into the waiting fingers of receiver Tee Higgins. All Lawrence did was throw for 347 yards and three touchdowns, becoming the first true freshman quarterback to win a national title since 1985, ESPN said. Clemson also won 15 games, the first team to do so since 1897, the sports network added. But amid all the hoopla, senior receiver Hunter Renfrow remarked with amazement at Lawrence's uncommon composure and leadership. "Look at him right now. This is his team. That's the leader of this team," Renfrow told ESPN after the win over Alabama. "And look at his face. You couldn't tell if he's just won the national championship or if he's just headed down to Chick-Fil-A to eat. He's ice, man." But football is only part of Lawrence's story. His Christian faith plays prominently in his life. CBN News noted that he's used social media to spread the gospel, that the image on his Twitter account is a large sign that reads "Jesus," and that his bio reads: "Clemson University / Pursuing Him at all costs." Lawrence told Twitter followers "about the privilege it is to have a Lord like ours," CBN said, and on Instagram he remarked, "Amazed at God's grace. Blessed to meet some amazing people and start this Journey of bringing some of the kingdom down here to Earth. Let that light shine!" Lawrence also told the Clemson Insider early in the season that the sport which has made him a star is "not like the biggest thing in my life" — and then revealed what is. "[I] put my identity in what Christ says, who He thinks I am and who I know that He says I am," Lawrence said, adding that "it doesn't really matter what people think about me or how good they think I play ... That's definitely been a big thing for me ... in my situation, just knowing that and having confidence in that."